People often ask me how I developed the characters in SHADOW OF THE LION. First, if they are historical characters I did as much research about them as I could. If they are fictional characters I researched their cultural background and the types of roles they play in the story. I started by keeping a bio file on them, longer bios for important characters, short thumb-nails for the minor players. From there I tried to imagine them by ‘tagging’ them to real live people so I could observe body language, facial expressions etc. This has had some interesting results, and because of the care I took in portraying them it helped to make them ‘alive’ on the page. Several months after one of my critique readers had finished SHADOW she phoned me and asked, “How is everyone?” I thought she meant our circle of friends. No. She wanted to know how the characters from the book were. She said she missed them! Then I knew that I had achieved what I wanted to do. I had created characters who were memorable and I had ade them alive on the page, visually as well as in descriptive words.SHADOW is populated with a fascinating cast. In this post I’ll mention a few of the key male players. 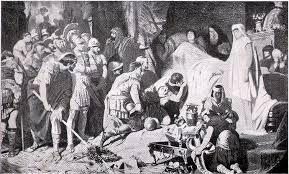 The story begins with the death of ALEXANDER THE GREAT but he is always present, the golden thread through the tapestry of the story. At his death-bed the conflict begins. Who will take over control of his empire? PTOLEMY who was Alexander’s illegitimate half-brother leads off the story in the Prologue and appears throughout to the Epilogues at the very end. Though he might have seized the throne, he chose instead to return to Egypt to build the city of Alexandria. I saw him as an honest, noble character and enjoyed researching the building of Alexander’s city. PERDIKKAS is the first to seize the moment at the king’s death-bed. One of Alexander’s top generals he took the royal signet ring from Alexander’s hand and proclaimed himself the leader of the army. I saw him as a handsome, rugged man but obviously self serving. An interesting thing happened when I was developing his character. On a visit to Asprovalta in Greek Macedonia, I walked into the local post office and there was Perdikkas sitting behind the desk. I was fascinated and made several trips back there, loitering around so I could observe him. I’ve spotted other characters in the same way and from those chance encounters made notes and did observations that help me keep the characters ‘live’ in my mind. Alexander died without leaving a legal heir. A month later his Soghdian wife gave birth to a son, Alexander IV, called by his Persian name ISKANDER in the story. When I first started writing SHADOW it was to be a juvenile historical based on the short, tragic life of Alexander’s son. Very little has been written about him other than he was dragged around army camps for the early part of his life, mistreated and not accepted. The story proved too political to write just as a young adult book so it was then expanded in the multiple point of view. 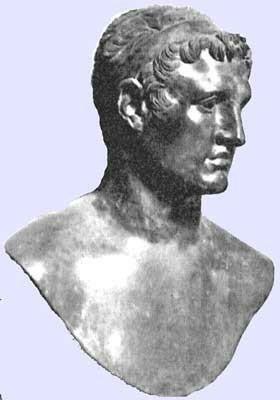 Because the Macedonian generals didn’t want a half-breed child ruling them they insisted on named Alexander’s mentally deficient half-brother ARRIDAIOS as joint king. In reading about poor ARRIDAIOS, who had supposedly been poisoned at a young age and had the mentality of a 3 year old, I also realized he probably had seizures due to his brain damage so that was another aspect of my research. Book one of SHADOW, subtitled BLOOD ON THE MOON, will cover the events from this point to when the royal entourage finally reaches Macedonia where the Regent ANTIPATER has held court in the absence of Alexander. The antagonist of the story is the Regent Antipater’s son KASSANDROS, who is present at Alexander’s death. His intrigues intensify the drama and tensions throughout the novel. In studying his character and the kinds of things he was known to have done I saw him as a psychopath. This made him a very interesting person to write about. There are several other important generals, Alexander’s Successors, all of them vying for control. Once the royal company arrives in Macedonia they are placed under the charge of POLYPERCHON, an older man, a seasoned veteran of several campaigns who is a soldier-of-fortune. A Greek man who I knew is the one who I connected to this character. There are only a few fictional characters in SHADOW. One of the most important is NABARZANES, the Persian Court Advisor who becomes like a father figure to little ISKANDER. I enjoyed doing the research about the Persians for the book because I wanted to shed some light on their side of the story. 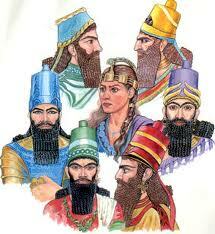 Nabarzanes once served King Darius and later became the Court Advisor for Alexander. He was an gracious, intelligent man and figures prominently. An amazing thing happened when I was developing his character. I happened to see a man who fit his description come into the bistro where I frequently went. I was intrigued, believing this man must be a Persian. It turned out Jabbar was actually from Baghdad (Nabarzanes was from Babylon). He, like Nabarzanes, was a gracious talented man who became a good friend and really inspired me to write the character of Nabarzanes. Another important fictional character is the old Chaldean MAGUS. In him I could see my own father or elderly Uncle who were such spiritual men. For minor characters, such as the young cadets and soldiers, when I lived in Greece while researching the book, my friend would point out to me and say, “Watch that table of young men. They are your soldiers!” I was constantly scribbling notes and observations on body-language and the interacting between men which I was able to put into the story to make the footsoldiers and cadets more realistic. In Book Two of SHADOW OF THE LION (subtitled THE FIELDS OF HADES) you will meet several other important characters, some of them Athenians, but I won’t divulge that just now. And in my next post I will introduce the strong cast of women who were very important throughout the telling of this story. This entry was posted in Uncategorized by W. Ruth. Bookmark the permalink. This is a fascinating read and I have learned so much about character development from your informative article. I have been researching the culture, economic times, and accent of one of the characters in my writings. It is interesting to note that you “tag” your characters to someone in life. Great way to help bring the character to life. Fascinating reading and I wish you every success with your novels! Thanks Lynne. I appreciate the feed-back. I’m glad you enjoyed this post. There’s another to come soon, about the women characters. Love your post about developing the characters of your novel(s). I spent 11 years researching and writing my Guinevere Trilogy–a historical version of The Matter of Britain from Guinevere’s point of view–and while I had to deal almost entirely with mythic characters, I went through much the process you have. In my case it often came down to what function did they serve in the legend, and the result has been backstory and psychological portraits of some of our most iconic figures. I’m not as familiar with your cast of characters, but very much look forward to following you blog and reading your books when the time comes. Thanks so much for you reply. Yes no matter what you are writing I think it’s important to research the backgrounds of your characters so even if it’s a mythic character you want to make them a ‘real’ as you. Your novel sounds fascinating. Guinevere is a very interesting character!